The Nitrogen Cycle – in a fix? The Environmental Chemistry Group held its annual Distinguished Guest Lecture & Symposium on March 9th 2011 at the RSC Chemistry Centre, Burlington House. The theme for the meeting was the effect on man and the environment of nitrogen speciation and utilisation. Around 50 delegates listened to four presentations, including the 2011 Distinguished Guest Lecturer, Professor James Galloway from the University of Virginia. Increase the fertiliser nitrogen equivalence value of animal manure. (Balanced fertilisation will reduce nitrogen consumption, and changes in the way animal manure is applied and incorporated into fertiliser will reduce ammonia emissions). Reduce combustion emissions and increase energy efficiency. International communities need to work together more effectively; choice and behavioural change provide major opportunities and the amount of animal products consumed by individuals must be reduced. In the second presentation, Professor Tim Jickells (School of Environmental Sciences, UEA) spoke on Atmospheric Nitrogen Inputs to the Marine Environment. As visualised from orbiting satellites, the colour of the earth’s oceans reveals chlorophyll distribution and is hence a map of phytoplankton distribution. All productivity in oceans is driven by marine phytoplankton, which needs N, P, Si, Fe and light to survive and multiply. Sources of oceanic nitrogen inputs are summarised to the right. Surveys of the oceans reveal the extent and complexity of nitrogen speciation in the marine environment. 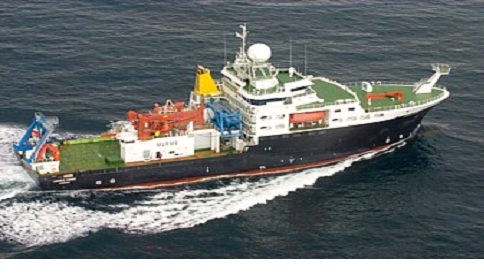 Sampling is carried out from the RRS James Cook (pictured left) in the Atlantic and on island sites (e.g. at the Cape Verde Atmospheric Observatory). Current work carried out primarily through the ‘Atlantic Meridional Transect’ cruise series (AMT; http://www.amt-uk.org/) shows high phytoplankton productivity in northern waters (due to deposition of European/US N-rich emissions), but low productivity near the equator (influenced by African emissions) and low productivity in Southern Oceans. There are three main components of nitrogen inputs: (a) NOx/NO3–, (b) NH3/NH4+ and (c) organic nitrogen compounds (with a significant urea component). Atmospheric organic nitrogen is operationally defined as water-soluble nitrogen in rain (or aerosols) that is not present as nitrate or ammonium ions. Carbon isotope evidence suggests that the carbon component is of terrestrial plant origin, which is consistent with other studies. Organic N is an important component of total nitrogen deposition and is partially bioavailable. The inorganic nitrogen sources are dominated by terrestrial anthropogenic emissions (in 1860 total fixed nitrogen deposition to the ocean is estimated as 20 Tg N yr-1 (29% anthropogenic) compared to 67 Tg N yr-1 in 2000; 81% anthropogenic). Atmospheric fixed nitrogen inputs to the oceans produce 0.25 Pg C yr-1uptake increase which should be compared with the IPCC estimated net ocean uptake of 2.2 ± 0.5 Pg C yr-1. Nitrogen in the atmosphere and in oceans was the theme for the first half of the meeting. In the third presentation, Professor Brian Chambers (ADAS) turned attention to terrestrial effects with a talk on Optimising Nitrogen Use Efficiency in Agriculture. Production of fixed nitrogen (100 million tonnes per annum) uses 2 % of the world’s total energy demands and feeds 30 % of the population. Reactive Nitrogen in the environment has doubled since the introduction of fixed nitrogen and the challenge for the 21st Century is to provide an adequate quantity of healthy food for the expected 9-10 billion world population without damaging the environment. The soil mineral nitrogen (SMN) pool is chiefly in the form of inorganic N (NH4+ and NO3–) and receives nitrogen from manures, atmospheric deposition, and fertilisers. It releases nitrogen via denitrification, NH3 volatilisation, and crop production. SMN is ‘crop available’ nitrogen – but this is susceptible to leaching which in turn is affected by complex seasonal factors. Hence the soil nitrogen cycle can be considered as a “leaky pipe” from which NH3, N2O, NOx and N2 are emitted into air and NO3–, NH4+, and dissolved organic nitrogen is released into water. Under normal conditions 24% of urea N is released to the atmosphere as NH3, which reduces to 7% when a urease inhibitor is present.The correct fertiliser application rate is important to minimise nitrogen leaching and optimum N-fertiliser application recommendations are made on a farm-by-farm basis. However, typically 20% of recommendations are too low (low yields) and 20% are too high (wastes money, increases leaching). So can recommendations be improved? Farm nitrogen management goals are to meet the nitrogen demands of crops/animals, to maintain a productive soil and to avoid damage to the environment. The best management practices are to use a fertiliser recommendation system (DEFRA, Planet Software, FACTs (Fertiliser Advisers Certification and Training Scheme) qualification) and to use the correct fertiliser type. Nitrogen fertilisers are estimated to be responsible for around 16% of UK ammonia emissions from agriculture. In Britain over the last 25 years manufactured fertiliser use has declined 25% for N and 45% for P due to improved efficiency of application by farmers. Urea fertiliser use has doubled since 1998 and ammonia emissions from urea are significant. This is being tackled by using urease inhibitors (e.g. Agrotain). Under normal conditions 24% of urea N is released to the atmosphere as NH3, which reduces to 7% when a urease inhibitor is present. However, it is livestock manures that are the main cause of controllable nitrogen pollution and part of the solution is to manage manures to increase nutrient use efficiency (cattle housing and slurry storage are sources of NH3 and land spreading is a source of ammonia and nitrate). The nitrogen in livestock manures is present in two forms: readily available nitrogen (rapid uptake) and organic nitrogen (slow (months/years) uptake). Nitrogen losses occur through two main pathways: rapid ammonia volatilisation and nitrate leaching. The Manure Nutrient Evaluation Routine (MANNER-NPK) is a decision support system designed to minimise NH3 losses to air. Different techniques for spreading manure make a huge difference to ammonia losses, for instance, slurry band spreading/shallow injection equipment minimise ammonia losses and odour nuisance, improve manure and user efficiency, and reduce environmental damage, but at a high capital equipment cost. Nitrate leaching losses following manure applications to soils depend on the season (e.g. for free draining soils: Sept. 20% loss, Oct. 17%, Nov. 10%, Dec. 5%, Jan. 3%). By identifying Nitrate Vulnerable Zones (NVZs), the EU Nitrates Directive tackles pollution (e.g. eutrophication) of waters caused by nitrogen from agricultural sources and establishes limits for surface or ground waters (50 mg/litre of nitrate). In the UK, NVZs cover 68% of agricultural land (62% after appeal by farmers). The EU would like the UK to declare the whole country as NVZ. Most monitoring sites show stable or decreasing nitrate contamination. In NVZs organic manures are limited by a livestock manure N farm limit (170 kg/ha – stocking ratio limit), an organic manure N field limit (250 kg/ha total N) and ‘closed’ spreading periods (e.g. slurry and poultry manure 1st Aug – 31st Dec only for arable farms on sandy/shallow soil). Brian’s three closing recommendations for interventions of maximum impact were to increase farm slurry storage, to encourage investment in band spreading, and to ban urea fertiliser (unless an inhibitor has been added). Following these three presentations, Professor James Galloway (University of Virginia) gave the ECG Distinguished Guest Lecture for 2011 – Nitrogen: a Story of Food, Feed and Fuel. He commenced by noting the challenge of converting nitrogen in the atmosphere into a usable form – 10 million biological species need nitrogen to survive and only 1000 species can convert it to a reactive form (Nr), so nitrogen is the limiting nutrient for many ecosystems. There are two sources of Nr – by biological fixation (BNF) and by humans; fossil fuel combustion and the Haber-Bosch (H-B) process (induced BNF). In 1850 the world population was 1.6 billion and sources of nitrogen included lightning, BNF, guano, nitrate and cultivation. By 2005 this had changed dramatically: fossil fuel (25 Tg N yr-1), cultivation (40 Tg N yr-1), H-B fertiliser (100 Tg N yr-1), industrial (23 Tg N yr-1), and natural (50 Tg N yr-1). In 1850 nitrogen uses were for grain, meat, energy and the nitrogen cycle was different from now – human activities had limited (but not zero) influence on nitrogen deposition. But by the mid-1990s increased demand for grain, meat and energy changed the nitrogen cycle, the H-B process creates 100 million tonnes of fixed nitrogen from the atmosphere each year and fossil fuel contributions doubled; and nitrogen deposition changed to become more global with more hotspots. Humans need 13 Tg N, consume 30 Tg N but create 140 Tg N because of the ‘leaky pipe’; 20% of N used in crop production enters someone’s mouth but the rest is lost to the environment (only 10% of N used in animal production is “eaten”.) The average adult consumes 5 kg N yr-1 but needs only 3. One environmental consequence of the increased nitrogen use is the creation of hypoxic and eutrophic coastal areas; these are largely areas linked to populations and food and the major input of nitrogen to oceans is via deposition. However, tracking the distribution of Nr distribution is difficult. For instance, a third of nitrogen produced was exported from one continent to another (31 Tg N fertiliser, 11 Tg N Grain, 0.7 Tg N Meat). And, importantly the price paid for imported food doesn’t pay for the environmental damage caused in the producer country by (say) nitrogen pollution. There is too much nitrogen and too many consequences – for instance, fossil fuel combustion produces smog, acid rain, particulate matter, forest, die-back, water acidification, eutrophication, hypoxia of fresh and marine water, and an impact on global warming and ozone concentrations. One nitrogen atom can contribute to each of these environmental changes in sequence – the “Nitrogen Cascade”. The overall goal is to optimise nitrogen’s benefits and minimise the problems and to tackle this man needs to control fossil fuel consumption, increase nitrogen uptake efficiencies in crops and animals, manage manure (fertiliser uptake, feed retention) and improve sewage treatment. This could give a 25% decrease in Nr release to environment. In order to do this the public has to be engaged with the issues because human actions control Nr introduction into the environment. N-Print (http://n-print.org/) is a tool to estimate Nr loss to the environment due to food, energy and materials and it asks about food consumption, resource use, food production to calculate use as a per capita nitrogen footprint; it builds on the concept of the carbon footprint; and hence has at least some pre-prepared public awareness. Current and predicted Nr ‘Creation Rates’ (Tg N yr-1) based on population increases alone are given in Table 1. But if it is assumed that everybody in the world has the same nitrogen lifestyle as everyone has currently in the US then the figures in Table 2 apply. This year’s ECG DGL & Symposium tackled the atmospheric, oceanic and terrestrial impacts that current nitrogen use has on the environment, and was brought to a formidable conclusion by the Distinguished Guest Lecturer. Briefly, and one hopes not simplistically, the conclusion from all four talks was that a solution to the environmental issues raised by a century’s application of the Haber-Bosch process is to reduce consumption.